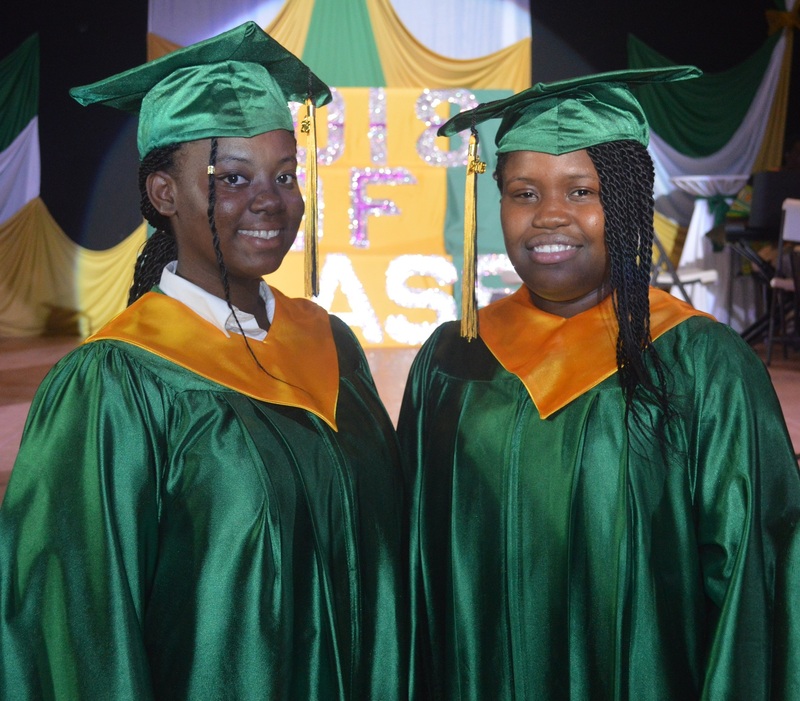 Valedictorian Shekanah Irish and Salutarian Katrice Fenton. Salutatorian for the 2018 Montserrat Secondary School graduation Katrice Fenton has been named as the top student in this year’s CSEC Examinations. According to a statement from the Ministry of Education, Fenton successfully passed 10 subjects with eight at Grade one level and two at Grade two. A total of 53 wrote the CSEC exams in May/June. There were 352 subject entries in the 2018 CSEC Examinations at General and Technical Proficiency Levels. Based on the provisional results Grades I – III passes were obtained in 256 of them yielding a pass rate of 73% down from the 75.8% obtained in 2017. Of the 22 subject proficiencies taken at CXC CSEC examinations, 100% passes were recorded in 11 of them namely: Principles of Business, Agriculture SA, Industrial Technology Building, Industrial Technology Electrical, Information Technology, Technical Drawing, Electronic Document Management and Preparation (EDPM), Principles of Accounts, Geography, Additional Mathematics and Physical Education (PE). Pass rates ranging from 90% to 97% were recorded for Office Administration, Physics and Chemistry. While Biology recorded a pass rate of 86%. Modern Foreign Languages recorded pass rates of 78% and 73% for Spanish and French respectively. Social Studies English B and Integrated Science returned pass rates below 50%. A pass rate of 66.7% was recorded for English A, similar to that obtained in 2016. Math recorded a 47% pass rate down from the 56.9% pass rate obtained in the 2017 exams. Kijahrie Barzey, Yanick Henry, Jaide Holder, Shenika Jarvis, Sydni Lee-Buffonge, Rhoniil Lewis, Eldina O’Garro, Jayden Ryan, Shaynae Taylor Lee each recorded passes in 8 subject areas. Eight students recorded passes in 7 subject areas, four students recorded passes in 6 subject areas while 5 students passed 5 subjects. A key indicator for the Ministry of Education is the percentage of students in the year five cohort who obtain five or more CSEC passes including English and Math. This year 43% the year five cohort obtained 5+ CSEC passes including Math and English. This performance is a notable 6%, an improvement on the 37% obtained in 2017. The school extended congratulations to the students who were successful, to their parents for their support and to the teachers for their hard work and dedication. The school also thanked members of the community who assisted by tutoring students in the absence of their substantive teachers.